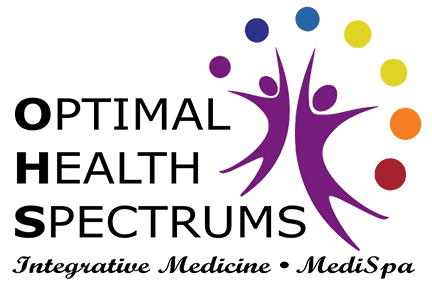 Optimal Health Spectrums provides nutrient therapy by both infusion and injection. IV nutrient therapy is the infusion of vital nutrients such as vitamins and minerals directly into the bloodstream. This bypasses the sometimes faulty digestive system and allows for maximal concentrations of nutrients to reach the cells and tissues where they are needed the most. Nutrient therapy is a fast and efficient way to replenish vitamins and minerals and revitalize the immune system. IV nutrient therapy is beneficial for many conditions including but not limited to gastrointestinal disorders, fibromyalgia, cancer, viral infections, chronic infections such as Lyme, neurological disorders, asthma, wound healing, and immune dysfunction. IV nutrients can help to prevent or recover from any illness, such as the flu. It is also a very useful procedure to do pre and post any surgery, to enhance and speed healing. For anyone with a gastrointestinal illness that affects digestion or absorption of food, such as Crohn’s Disease, regular nutrient IV’s can cause a dramatic improvement in health. People with vitamin and mineral deficiencies suffer internally with issues such as fatigue and decreased immune function. They can also be afflicted externally with skin issues such as eczema, acne, uneven tone, and dull, flaky skin or hair loss. We offer a large variety of nutrient infusions, ranging from vitamins A, D, C, and E, as well as the B vitamins and folinic acid. We also offer IV infusions of several important minerals, including magnesium, zinc and selenium. In addition, we administer IV phosphatidylcholine (which is an essential component of all cell membranes) and IV glutathione (the master antioxidant and most important detox agent in the human body). In addition to IV therapies, Optimal Health Spectrums also offers essential nutrients such as Vitamin B12 and Vitamin D by injection. These injections take only a couple of minutes. Infusions typically take 30-60 minutes. Our competent and caring staff are proficient in all infusion and injection therapies.